Cups and Mushrooms is a fun, active game for two teams and is best played with larger groups of children – at least 10 but preferably more. Ideally played in a large space where there is room to run around – indoors or out. To play Cups and Mushrooms you will need a set of equal-sized cups, cones or markers. The cups do not have to be closed – in fact it may be easier if they are hollow. However, one end should be significantly narrower than the other, and they should be stable when stood up on either end. This can be more of a challenge when playing on an uneven surface such as grass. 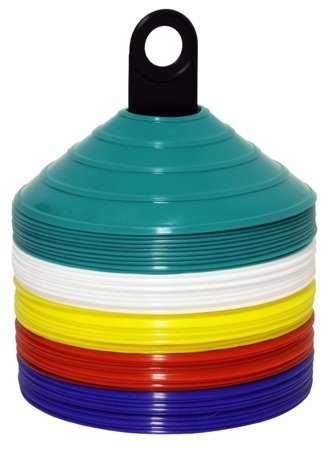 We would recommend these Field Marking Coaching Cones because they are quite smooth and have a nice feel to them, yet also have ridges to make it easy to pick them up, and they should stand quite easily even on their narrow end. They’re also nice and bright. Alternatively you could use plastic or paper plates or discs. In this case, they should not be multicolored but instead have a single color on one side and a different color on the other. Divide your group of children into two equal teams and have them sit in two straight parallel lines opposite and facing one another. Have a gap of at least 10 feet between the teams. Now take your markers/plates/cups and spread them evenly in the space between the two teams. Try to put about half one way up (cups) and half the other (mushrooms). Name your two teams. You’ve guessed it – one is ‘team cups’ and the other is ‘team mushrooms’. Set a timer for a couple of minutes – less if you want very rapid games and more if you want to tire them out, although it’s probably better to play a few short rounds rather than one long game. The kids in “Team cups” has to turn over all the objects so they look like cups. The kids in “Team mushrooms” has to turn over all the objects so they look like mushrooms. Of course the fun part is that they’re all doing this at the same time. Perfect organized chaos! Blow a whistle or other loud object to start the game, and then another at the end to stop. When each game round is over, the kids need to sit back down in their team lines. The adult game leader and possibly another helper then tallies up how many of both cups and mushrooms are on the field of play. The team who has the most of their own set wins a point. You can play several rounds to get an overall winner, or just do it for the sheer fun of it. You could play an interesting alternative game with just a few kids, perhaps on a desktop or small floor space, by using two-color discs and having them use their fingers to flip the counters over. You’ll want to ensure the game plays as safely as possible while still remaining fun. Most of the time just use common sense. Don’t set up too small an area if you have lots of kids as they will be running around and possibly colliding with each other. Do have them in appropriate footwear, or barefoot, depending on what surface they are playing on. Watch out if you have a very large age range. It may be better to have separate games for younger kids and teenagers. No bad behavior, fighting, or cheating to be tolerated in the game. It’s supposed to be fun. You may need to calm down ultra-competitive kids!